Aaminah Snowdon was born in 1990 in Northallerton, North Yorkshire, and is a self-taught artist. Her lively style and vibrant colours impress the quirkiness, movement and character of her animal subjects. 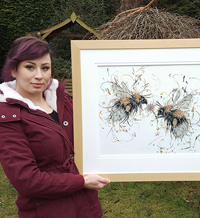 About the artist: Aaminah Snowdon was born in 1990 in Northallerton, North Yorkshire and is a self-taught artist. Her avid interest in art started at the age of 7 when she won a school competition by painting a rather surreal whale blowing out multi-coloured water spouts! In 2012, after earning herself a 1st class honours degree in Ancient History at The University of Birmingham, Aaminah decided to pursue a career in art, with a focus on developing her own unique style that would combine her interests: animals, humour, eccentricity, bold colours and energy. She appreciates the vast array of painting styles, composition and subject matter and favours the eccentric and unusual. Working on watercolour paper using acrylic paints, she paints using lively and spontaneous brushstrokes with bold, vibrant colours to impress the quirkiness, movement and character of her subjects. She completes each painting with its own witty and fun title. Aaminah's love of all animals started at a very young age. She was always keen to rescue animals, whether injured ones or just moving snails off the pavement so they didn’t get trampled. Her fondness for animals has persevered up to this day, for she continues to rescue animals and regularly donates a percentage of her profits to animal charities, notably The Wildlife Haven in Thirsk, North Yorkshire. Visiting art museums is a favourite past time of Aaminah's.